Job advertiser criticizes and labels Filipinos stupid! 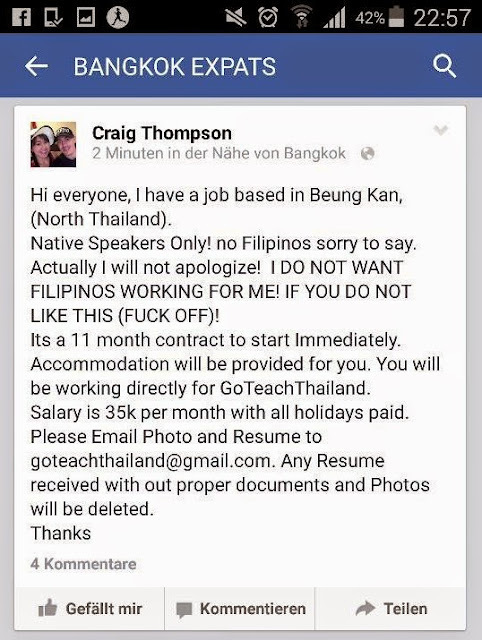 Just a few weeks after a Thai national asked for a voluntary deportation following his racially-offensive comments against Filipinos while working and living in the Philippines, another person that goes by the name Craig Thompson is making a name for himself, too. This time it’s in Thailand. Judging from his ad, this infamous Mr. Thompson guy works or probably run this GoTeachThailand agency/company. As you can see, he used the “F” word for people who don’t like his idea of excluding Filipinos to be part of his team. He doesn’t like Filipinos? Yeah, I get it! We have the power to not like something or someone, but airing his lungs considering he’s in charge of education and in molding the young minds of Thailand? I absolutely don’t get it! 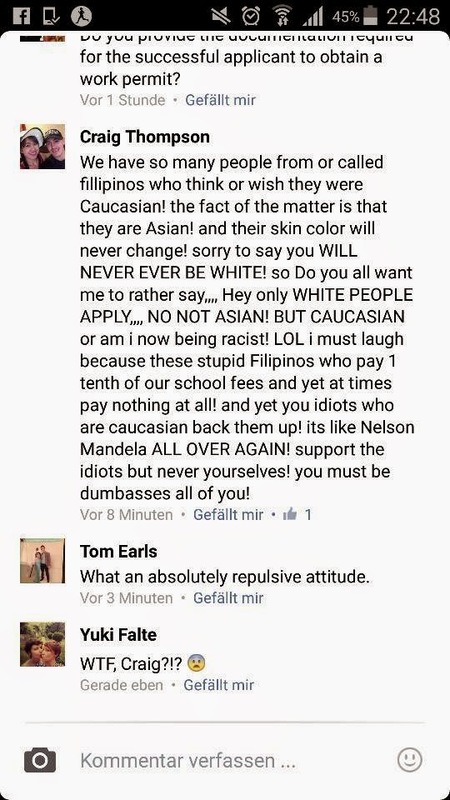 He said Filipinos wish to be white. Sorry, I don’t. I actually love my forever tan color. Do you wish to get a tan too? Stupid Filipinos? Did I read it right? How can someone like this guy run a business in education? He certainly hates Filipinos who, by the way, are Asians. And yet he’s in Asia! He even made a comparison that the attitude of Filipinos is worse than a homeless black man. Generalizing all the homeless “black” people too? Nice try! And here’s the last of his offensive remarks. Cool, eh? The guy in questions is becoming popular by the day. His post in Bangkok Expats Facebook page, although deleted now, is still a hot topic of discussion there. Thanks to people who managed to take screenshots of his original post and comments. Update 16 May, 2015: Craig Thompson claimed he lost his phone and the one who stole the phone was the person behind this offensive remarks. It could be true. Let’s give Mr. Thompson the benefit of doubt, shall we?